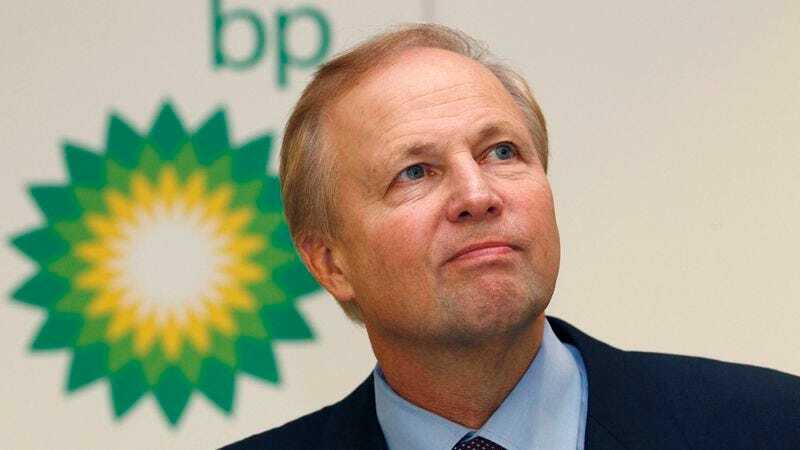 LONDON—After his company agreed to plead guilty to 14 criminal charges in connection with the Deep Horizon accident and oil spill, BP chief executive Bob Dudley released an official statement Thursday expressing his “profound and heartfelt remorse” over the loss of $4.5 billion in fines. “All of us at BP deeply regret any negligence on our part that may have led to this tragic oil spill and the tremendous damage it has inflicted upon our profitability,” Dudley said of the disaster that may eventually cost his company more than $40 billion in settlements and penalties. “We never intended to upset the incredibly delicate balance of our finances, and efforts to restore the billions of dollars lost in this unspeakable catastrophe will continue until we ensure ensure just compensation for every last shareholder.” Reached for further comment, Dudley told reporters that while he feels “tremendous sorrow over losing $4.5 billion,” he’s just thankful it only amounts to 1 percent of the company’s gross revenue for 2011.